Rail tracks and crane pads are being installed for the new Florida East Coast Railway (FEC) Intermodal Container Transfer Facility (ICTF), which is slated to open in the summer of 2014. 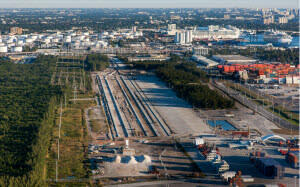 The $73 million, 43-acre near-dock rail facility in the Port’s Southport containerized cargo area will be used to transfer domestic and international shipping containers between ship and rail, and will replace FEC’s existing 12-acre intermodal yard which is currently located several miles from Port Everglades on Andrews Avenue in Fort Lauderdale. In addition to installing the rail tracks and crane pads, buildings are under construction and the road to the facility is ready to be paved. The Port Everglades ICTF will allow FEC to build 9,000-foot unit trains within the facility without blocking any city streets and will allow cargo to move through Port Everglades to/from Atlanta and Charlotte in two days, and Nashville and Memphis in three days. FEC’s connections to CSX and Norfolk Southern railroads allow for rail service to 70 percent of the U.S. population within four days. Port Everglades contributed the land for the ICTF valued at $20 million. Construction costs are estimated to total $53 million and are being funded with an $18 million grant from the Florida Department of Transportation’s (FDOT) Strategic Intermodal System program, a $30 million FDOT State Infrastructure Bank loan to FEC, and $5 million from FEC. View the ICTF video on YouTube. Florida East Coast Railway is a 351-mile freight rail system located along the east coast of Florida and is the exclusive rail provider for PortMiami, Port Everglades, and Port of Palm Beach. 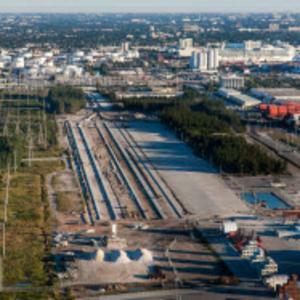 FEC connects to the national railway system in Jacksonville, Florida, to move cargo originating or terminating there. Based in Jacksonville, Florida, FEC provides end-to-end intermodal solutions to customers who demand cost-effective and premium quality. For more information, visit fecrwy.com. Port Everglades is one of the nation’s leading container ports, handling nearly one million TEUs annually and serving as a gateway to Latin America, the Caribbean, Europe and Asia. Located in Greater Fort Lauderdale, Hollywood, Dania Beach, Florida, Port Everglades is in the heart of one of the world’s largest consumer regions, including a constant flow of visitors and up to 110 million residents plus seasonal visitors within a 500-mile radius. Port Everglades has direct access to the interstate highway system and the FEC intermodal hub, and is closer to the Atlantic Shipping Lanes than any other Southeastern U.S. port. Ongoing capital improvements and expansion will ensure that Port Everglades can continue to handle future growth in container traffic. A world-class cargo handling facility, Port Everglades serves as an ideal point of entry and departure for products shipped around the world.